Only tickets purchased before 3.30pm on Thursday 19th April will be posted to supporters. All tickets purchased after this deadline will be available for collection only from Villa Park. Only tickets purchased before 3.30pm on Thursday 26th April will be posted to supporters. Supporters are advised to collect their tickets as early as possible to avoid the disappointment of missing kick-off. Tickets can be collected from the Villa Village Ticket Office up to 12.30pm on matchday after which point, tickets can only be collected from the Trinity Road Ticket Office which will be open from 1pm. All Pride Rewards members will receive 20 points upon purchase. However, points will not be awarded for additional purchases made by other supporters. Only tickets purchased before 3.30pm on Thursday 3rd May will be posted to supporters. 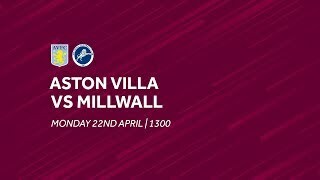 All tickets purchased after this deadline will be available for collection only from Villa Park.